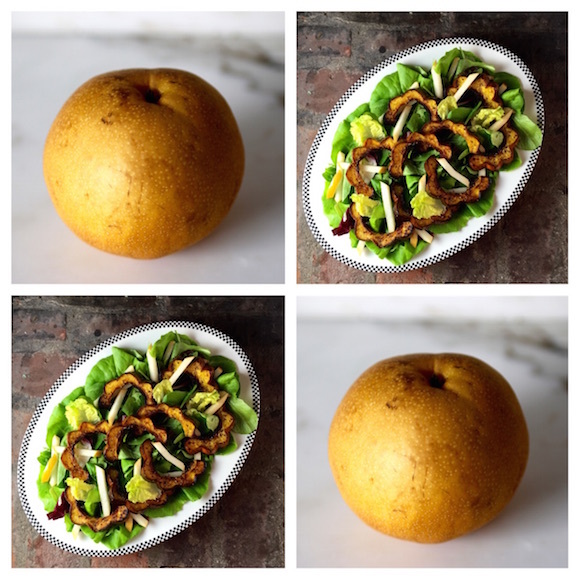 Looking for a salad that just screams Fall? Look no further. 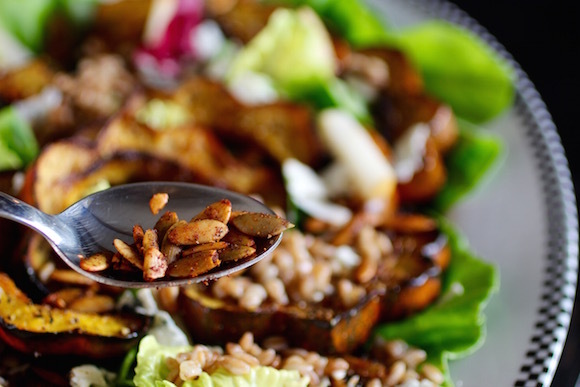 Crisp, juicy, sweet Korean pear contrasts the tender roasted acorn squash while farro adds a chewiness and nutty earthy notes. Crumbly, salty bleu-veined gorgonzola and smoky spicy pumpkin seeds add amplitude. It is all harmonized by the dressing, a deep ruby-hued tart vinaigrette. 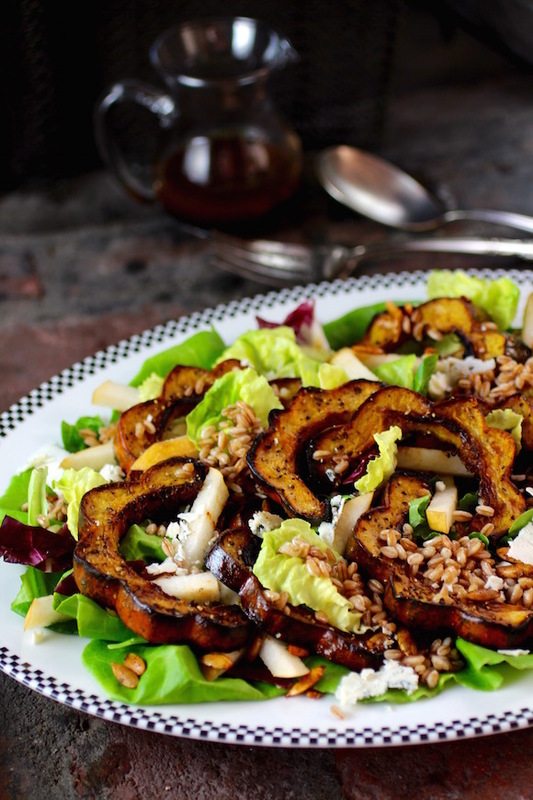 Color, texture, flavor, a feeling of abundance – it’s all right here in this stunning seasonal salad. Choose an acorn squash that is relatively heavy for its size, mostly dark green with little to no orange (unless it is an orange variety), with a sturdy stem with no mold, and a firm shell with no soft spots. Wash the squash, then slice vertically through as close to the stem as possible, with a serrated knife on a sturdy cutting board. Scrape out the seeds and stringy pulp. Then slice the squash halves into half-moons. Toss with olive oil, season with salt and pepper. Cover a baking pan with a sheet of parchment paper. 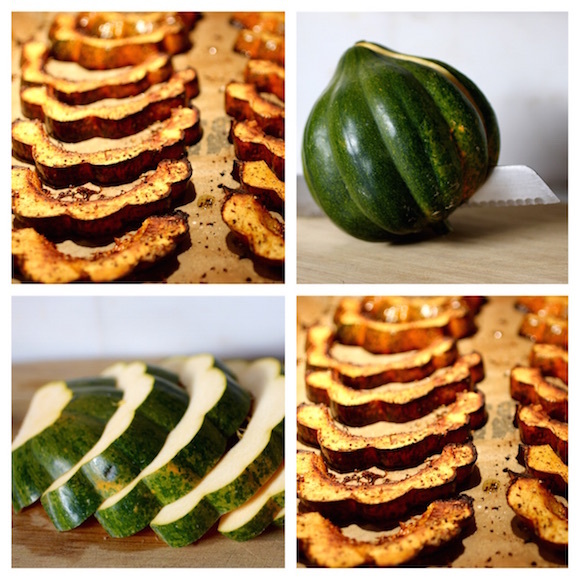 Arrange squash on the parchment and bake in a 425°F oven until tender and nicely browned, about 30 minutes. Let cool to room temperature for the salad. Heat oil in a non-stick pan. Stir in chili pepper, paprika and salt. Add pumpkin seeds and toss to coat. Place a bed of lettuce on a platter. 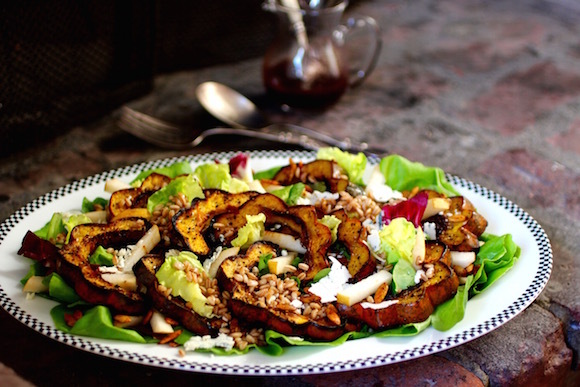 Arrange squash and pear batons on top of the lettuce. Spoon farro and pumpkin seeds over the top. Finish with shaved gorgonzola. 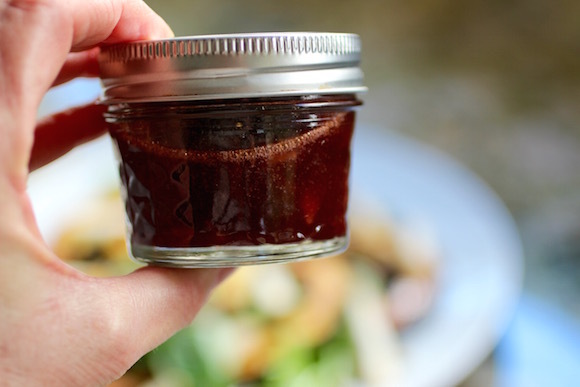 Drizzle pomegranate vinaigrette over the salad just before serving. #FallFest is a season long franchise where Food Network editors team up with bloggers to share recipes about everyone’s favorite autumn dishes. 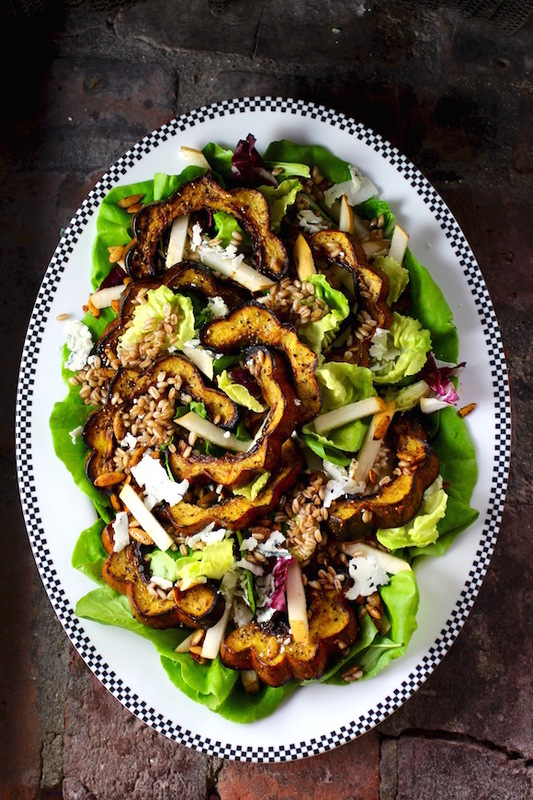 You might enjoy taking a peek at other SQUASH recipes from some fabulous bloggers below… and be sure to follow our very popular Pinterest Board with over 325,000 followers called Let’s Pull Up A Chair! 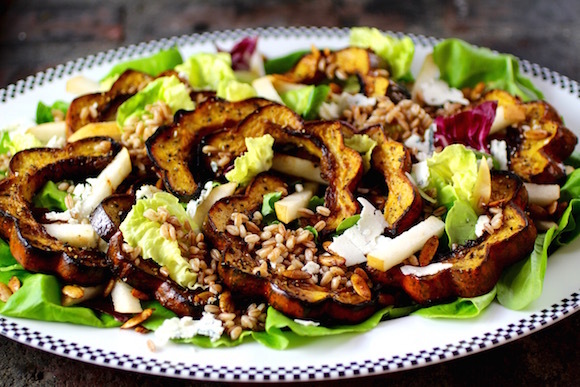 Today finally feels like fall…this will be the perfect salad tonight! Thank you!